It's hard to believe the consumer version of Oculus Rift is two years old already, but we suppose time flies when you're having fun in virtual reality. The VR headset that kickstarted a revolution is celebrating its second anniversary in style with deep game discounts, an Oculus Store credit when you buy a Rift, new content, and a contest with loads of prizes. Oh, and LA Noire: The VR Case Files is joining the Rift game library. Let's start from the top. Oculus is offering huge discounts on some of its best VR games in the Oculus Store, to the tune of up to 75% off. Discounted titles include Lone Echo, The Mage's Tale and Star Trek: Bridge Crew. While the discounts don't apply to every game in the Oculus Store, you will find special daily deals on games as well as savings on some of the biggest titles on the Rift platform. If you're in need of an Oculus Rift, or plan to gift one but also want a little something for yourself, you can take advantage of a $50/£50 Oculus Store credit when you buy a Rift. Now through April 3, any Rift purchase earns the credit. 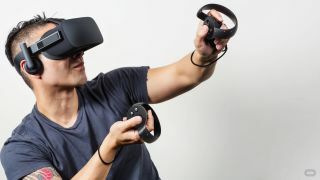 Oculus noted that select retailers in the US, Canada and Europe will have similar offers for new Rifts purchased through them, though the particulars of each retailer's promo may vary. Joining the celebration are updates to OrbusVR and Ultrawings. OrbusVR is being treated to a new Shard Dungeons update on March 30, which includes new levels, gear and enemies. The best part? It's free. Ultrawings will see new landscapes and races with its update, plus the exciting addition of Hands On Throttle And Stick support, which sounds like wicked fun. For those that love a contest, the Rift Gold Rush could be for you. Join a match and play your way to victory, and you could win prizes including Oculus Store credits, a new PC, or a Golden Account that gives you free access to 100 games. A Brass Tactics free weekend is the first in a series of Rift Gold Rush events. It runs from 1pm PT - 2pm PT on Thursday, March 29. Just join a multiplayer match and see how far you get (who knows, you could win). Last but not least, Oculus is capping off its anniversary festivities by announcing LA Noire: The VR Case Files is landing on Rift on March 29. The well-received Rockstar title has up until now never made it past HTC Vive, so it's a big get for Oculus. While none of today's offers are as earth-shattering as, say, an Oculus Rift price cut or the launch of Oculus Go, it should give Oculus Rift owners reason to celebrate, too.